The president says Crimea will be free again. On 18 May, Ukraine and the world remembers victims of the Crimean Tatar deportation.This day in 1944 the Soviet authorities started deporting Crimean Tatar residents of Crimea on the false pretext of mass treason and collaboration with the Nazis. By 20 May, around 180,000 people, who only had minutes to pack up the essentials, have been driven out to remote areas of the Soviet Union in inhumane conditions of railway carriages normally used for livestock. 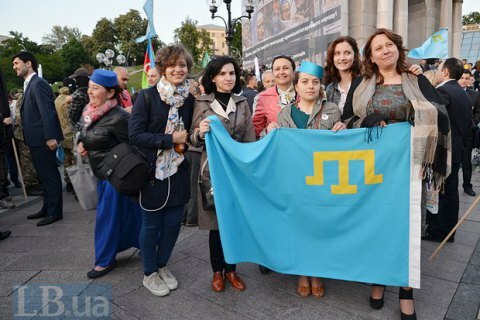 In addition, 6,000 young Crimean Tatars were mobilized into the army and sent to Kazakhstan while 5,000 Crimean Tatars were sent to the Moskvougol prison camp. Around 32,000 NKVD officers were involved in the deportation operation. "Today, the whole world remembers the terrible events of 1944 when, on the orders from the leaders of the totalitarian regime, Crimean Tatars and representatives of other national minorities were forcibly deported to the remote areas of the Soviet Union. The pain of the Crimean Tatar people is our common pain. [This is] the pain of dozens of thousands of Crimean Tatars who never returned to their native Crimea. We will never forget the cynical crime of the Soviet regime, a crime against the whole people, against humanity. I am sure that modern criminals will be punished for the occupation of the Crimean peninsula, and Ukrainian Crimea will again be free," President Petro Poroshenko said on Facebook.